Visit Zero Zone Booth #300 at IIAR 2016! | Zero Zone, Inc. Visit Us at IIAR 2016! – Zero Zone, Inc.
Visit Us at IIAR 2016! Home/Expired/Visit Us at IIAR 2016! Stop by and see us at Booth #300! 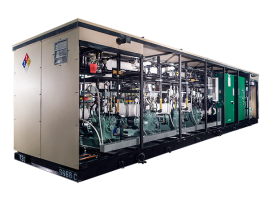 Zero Zone designs and manufactures custom-engineered halocarbon, CO2, and low charge ammonia refrigeration systems for cold storage / distribution, ice rinks, pharmaceutical, food processing, and other industrial applications. The IIAR Technical Program is the core of the Annual IIAR Conference. It is a series of presentations which includes rigorously peer reviewed technical presentations, experiential workshops, and interactive panels. IIAR publishes the technical paper proceedings at each year’s conference and provides access to digital copies to each conference attendee. Don’t miss the presentation of the Technical Paper, “Expanding the Use of Ammonia Refrigeration” by John Collins! by John Collins, Industrial Sales Manager, Zero Zone, Inc.
Today’s world is putting new demands on our refrigeration systems. Regulatory changes driven by environmental concerns are creating uncertainty with the use of synthetic refrigerants. There is also a higher level of public awareness of the environmental impact of refrigeration. The development of new technology offers new capabilities and options for refrigeration system design. This is creating opportunities to use ammonia in applications and markets where it has not been used in the past. Summary of regulatory factors affecting refrigerant selection including the Total Equivalent Warming Index (TEWI). Summary of technology now available which makes ammonia refrigeration feasible in new applications. Potential new applications and markets for ammonia refrigeration, including a case study of a recent ammonia / CO2 cascade system installed at a retail grocery market. Steps our industry can take to support these new applications. Ammonia can become a more widely used refrigerant, and serve markets in applications where it has not been traditionally used. This will take a change of thinking in how we use the refrigerant and how we design safe and effective systems. In taking this step the industrial sector can learn some lessons from the commercial sector in how to make refrigeration systems user friendly and cost effective. Get the rest of the Technical Paper at IIAR! By Jessica Nemitz|2016-08-18T14:35:36+00:00March 4th, 2016|Expired|Comments Off on Visit Us at IIAR 2016!